High quality, fertile topsoil is rich in soil organic matter. Soil organic matter (SOM) is formed by the biological, chemical and physical decay of organic materials on the surface and below the soil. This is made up of plant and animal residues at various stages of decomposition, cells and tissues of soil organisms, and substances produced by soil organisms. Soil organic matter is a vital part of our soils and helps soils hold onto water and nutrients and supports and provides food for soil microbes that recycle nutrients. 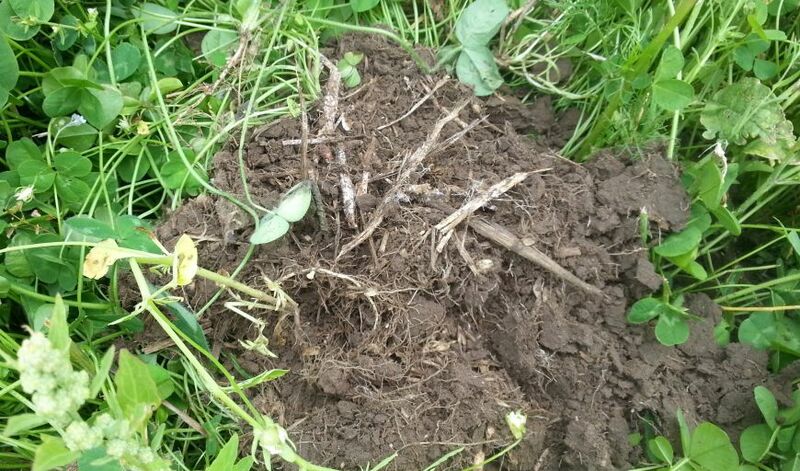 Soil organisms, including micro-organisms, use soil organic matter as food. As they break down the organic matter, soil microbes play the most important role in the nutrient cycling process and in the ability of a soil to provide the crop with not just macro nutrients but also trace elements to create a healthy product. This process is called mineralisation. Adding and increasing SOM in our soils is especially important for building humus. Humus is dark, organic material that forms in soil when plant and animal matter decays. Put simply Humus is the biologically active or living fraction of soil carbon. Humus has many benefits one of the most important is that Humus holds its own weight in water. In addition humus stores nitrate nitrogen stopping it from leaching, increases the soils cation exchange capacity (CEC) and stores C (sequesters) from the atmosphere. The easiest way to increase your soil carbon levels is to incorporate more organic matter into and onto your soils, such as by maximising ground cover and mulching. We can also add carbon rich inputs to increase the amount of SOM, these include composts, humates and other products like vermicast. These products can energise the soil biology and feed the soil rather than just feeding the plant. This is an important strategy but we also need to enhance the microbes that play such a crucial role in soil development and humus formation. Specifically fostering a diverse soil flora can accelerate soil regeneration and build SOM levels. While plants are the original source of carbon for soils, microbes control its fate by using it as food, thus ensuring that at least some of it will remain in the soil. To ensure we are looking after the microbes we need to think about no-till or minimal till systems where possible, using biologically friendly fertilisers and using stimulants like EM as a way to boost this activity. Adding EM to the soil does many things. Firstly EM will help the decomposition process of organic materials, and during fermentation will produce normally unavailable organic acids, such as lactic acid, acetic acid, amino acid, malic acid and bioactive substances and vitamins. These substances stimulate native microorganism populations and are known to promote plant cell division (growth). Secondly the diversity of microorganisms contained in EM and the metabolites they produce will increase the number and diversity of microorganisms in the soil. When microorganisms are activated, protozoans and larger organisms such as worms will increase in number and a healthier ecosystem will result. This also plays an important role in SOM recycling and building humus as a full range of organisms in the soil food web is required for this complex process. EM will also prevent the production of ammonia during protein decomposition, metabolizing proteins in such a way that amino acids are produced instead. These amino acids can be directly absorbed by plants. Also, under normal circumstances, cellulose will be decomposed and broken down to form carbon dioxide. However, due to the fermentation action of EM, low-molecular polysaccharides will be produced and these will be absorbed by microorganisms and plants. Polysaccharides (repeating units of sugar-type molecules connected in longer chains) promote better soil structure through their ability to bind inorganic soil particles into stable aggregates. Some sugars may stimulate seed germination and root elongation. Other soil properties affected by polysaccharides include CEC, anion retention and biological activity. EM efficiently breaks down organic matter into stable humus, a key component to aggregate formation, by reducing oxidative forces that primarily rob the soil of Carbon and Nitrogen in the form of methane and ammonium gases, respectively. This is achieved from a reduction of available Hydrogen ions due to a favourable change of organic acid composition and concentration in the soil. The result is that a greater amount of organic matter is converted to humus, aiding in aggregate formation. In this trial published in the European Journal of Agronomy (vol. 46, April 2013), they looked at Long-term effective microorganism’s application to promote growth and increase the yield of rice. This trial, conducted over 11 Years, found that the long-term application of EM caused significant changes in soil physical-chemical properties (Table 1). Soil organic matter, total N, alkaline-hydrolysable nitrogen, and available K content was significantly (p < 0.05) higher in the two compost plots than in the control plot, with the EM treatment outperforming the traditional compost in all facets. See the table below. A Polish trial (Filarski, 2016) from the Złotów district looked at the impact EM has on the humus content of the soil. EM was applied on crop residues (straw 100% ploughed) over three years of application. This treatment was across 50 hectares with a large control area. After 3 years soil was tested for the humus content (sample 1 - EM, sample 2 - control). In Spain a trial published in the Brazilian Society of Soil Science Journal (vol.27, May/June 2003) and conducted in Madrid, evaluated the properties of a clay loam soil enriched with organic matter and microorganisms under controlled temperature and moisture conditions, over a period of three months. In this trial the conclusion was drawn that the incorporation of a mixture of effective microorganisms (EM) intensified the biological soil activity and improved physical and chemical soil properties, contributing to a quick humification of fresh organic matter.